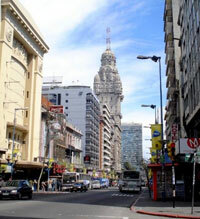 The inner city neighborhood of Centro (a prime area) is also Montevideo’s downtown. As its name indicates, Centro is right in the heart of the city, so it is constantly on the go. Traffic is an everyday problem. Many of Centro’s shops, restaurants and cinemas are along 18 de Julio Avenue. There are real estate bargains to be found in Centro. However, some areas of the neighborhood less than appealing because of the pollution from traffic and incidents of crime such as theft, purse snatching, and mugging. 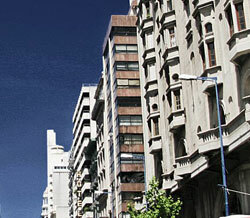 Avenida 18 de Julio is one of the important avenues in Montevideo. Its name honours the date of the promulgation of Uruguay’s first Constitution. At one end is the imposing Obelisk of Montevideo, at the avenue’s junction with Bulevar Artigas. In the centre of Plaza Independencia is another monument: the statue of the national hero, José Gervasio Artigas. Underneath the statue is the mausoleum where his remains are buried. Avenida 18 de Julio is also home to the Palacio, the Municipal City Hall and the Universidad de la República.